Great analysis, as usual. I noticed the JunkFood Science blog doesn't allow comments. Never a good sign when you don't want feedback. Here's the question I'd like to ask Sandy, if anybody knows how to contact her (or if maybe she reads this blog): the biochemistry of fat storage is well-understood (learned all of this from Gary Taubes' excellent lecture at UC Berkeley). Fat cells make alpha glycerol phosphate in order to bind free fatty acids into triglycerides, the form in which fat is stored. Alpha glycerol phosphate made from glucose. The only way to get a large amount of glucose into the fat cells is to raise insulin. Thus, the only way the fat cells can store a signficant amount of fat is if you consume an associated amount of glucose to a) provide the raw material for alpha glycerol phosphate, and b) to raise insulin enough to transport that glucose into the fat cells. So the question for Sandy(and others of her persuasion) is how can carbohydrates be anything but fattening? Or conversely, how can you possible gain fat if you don't eat any carbohydrates? I love this little piece of biochem, as it provides the molecular basis for what we low-carbers already know: eating fat does not make you fat. It makes you full. I'd hardly consider an 8.4 decrease in G-Index a significant reduction in G-Load. Not to mention Both GL's are still in the High Range 125.9 vs 145. Thanks for the explanation. When I read the post at Junkfood Science, I figured that both groups were eating a high carb diet, and that was why there was no weight loss, regardless of the glycemic index. Your explanation confirmed that. On this one it is important to note the women were not attempting to restrict calories or lose weight. The study was designed to see the effects of a maintenance diet with varying glycemic index foods...and I think the results speak to the effect! I agree, but will add that I think this one was a good showing of what happens when you replace foods you currently eat (as we're repeatedly told is the way to go) with foods promoted as being "healthier" because they're lower for GI but are still, as we know, high carbohydrate (think whole grains). These "scientists" are so desperate to prove their point that they lose all credibility. How could they avoid commenting on the overall weight gain of all the subjects on this calorie-modest diet? Good pick-up, Regina. Pity the researcher who tries to pull a fast one with a misleading abstract conclusion!! Regina will root you out!!! Beware the Weight of the Evidence!!!!! They would rearrange the deck chairs on the Titanic....pathetic fools. I read the Junkfood post's conclusions about how we can all eat sugar and flour and not get fat or diabetes. All I could do was laugh - I keep thinking, have you ever tried a low carb diet? Have you ever talked to anyone who has? So the question for Sandy(and others of her persuasion) is how can carbohydrates be anything but fattening? It's amazing, isn't it, how the basic biochemistry is ignored. I wonder how long it will take review committees to catch up and start rejecting studies that ignore bio chem mechanisms. Do they even know the theories themselves? Great job picking that one apart, and thanks for going and getting the details for us! Interesting to think that even if already overweight, if you ate about 1800 calories a day of "healthy whole grains" you would be constantly getting fatter. Hmmn, and they wonder why obesity is an issue. But really, the important thing to take from this, sez the media, is that we might as well eat MORE junky carbs 'cause it's not much diff than the so-called good stuff! How come putting obese women on a diet that makes them gain weight, is not unethical? Not one word about that? 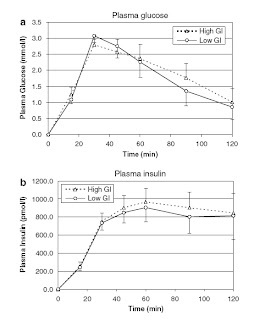 I see the difference in carbs from low to high GI was only 25g. This is like 1 piece of candy. What a waste of time and money this test was. I am a diabetic and I have been tracking/ charting BG vs what I eat for a year. One of the things that was obvious in measuring BG after meals, is the fallacy of low GI <55 recommndations. It seemed to make no difference ... the graphs in your blog show why. The only kind of carb that truelly works for BG control for a diabetic (or fat accumulation for the rest)is ultra-low GI <15 (i.e. veg, ...) and zero GI (protien and fat!). All these studies, it would seem are still trying to keep the 200plus gms of carbs recommendations alive despite all the evidence to the contrary. While there are certainly some interesting TRENDS associated with GI, if there was not statistical difference, you CANNOT say that there was a difference. BOTH groups increased overall waist circumference and weight (non-significant increase), which may reflect one of any number of things, including time of day, time of year (holiday time?) or the unusual circumstance under which they were eating breakfast(monitored in a laboratory setting). Additionally, if you took a look at the error bars on the graph, there was a significant amount of inter-individual variation. Saying that these researchers used statistics to mislead in this study is obtuse. As far as the issue on ethics, most institutional review boards like to see some sort of weight loss program (diet exercise counseling) for the subjects following the completion of the study, if so desired by the participant. Finally, the poster who is aghast at the realization that there was only a 25g difference in CHO has missed the point. They were investigating the effect of a diet's (specifically, the breakfast meal's) glycemic index, not the effect of varying the relative amount of different macronutrients.